Danny Valencia's pinch-hit, three-run homer off Red Sox reliever Junichi Tazawa helped lift the Toronto Blue Jays to a 5-2 win over Boston at Rogers Centre on Wednesday night. 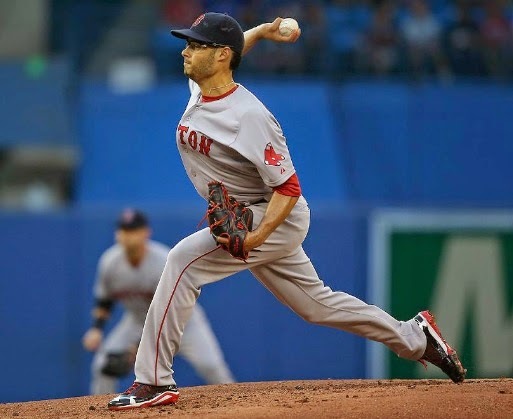 Red Sox starter Joe Kelly (pictured) took a no-decision in the loss, going six-plus innings. He was charged with two runs on three hits and two walks while striking out four. The Blue Jays took an early 1-0 lead in the bottom of the first inning on Jose Batista's 26th home run of the year. Boston jumped out on top with a pair of runs in the top of the sixth inning. An RBI single by David Ortiz plated David Ross; Brock Holt scored on a wild pitch. The Blue Jays scored four in the seventh inning as Tazawa's Toronto road woes continued. In seven career innings at Rogers Centre, he has allowed eight runs on a dozen hits. His overall numbers against Toronto aren't pretty, either. Tazawa has a 1-3 in 20 appearances which works out to 19.1 innings in which he's allowed 16 runs on 29 hits. His ERA versus the Blue Jays is a whopping 7.45.